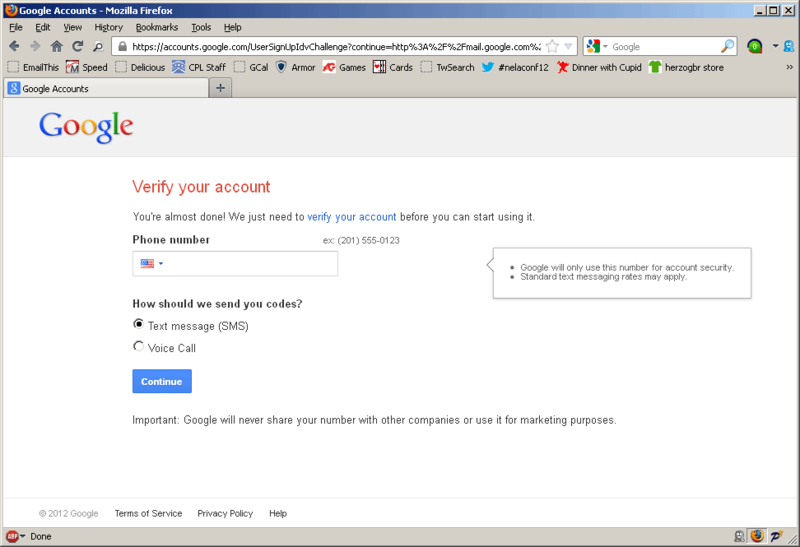 I recently ran across Google's "phone verification" for Gmail account creation. Essentially, our computers have been used to create Gmail accounts enough times that patrons are now asked to provide a working cell phone number when creating a new account - one that they can use to retrieve a passcode within minutes and one that hasn't already been used to verify accounts too many times (so I can't just give them the library's number). This is just not an option for a good number of our patrons - they either don't have a phone or their phone is out of minutes or they're saving the minutes they have for job call-backs. Mind you, the library is often their only source of internet access and an e-mail address is often required to apply online for jobs, social services, unemployment benefits, etc. The only solution I know of is to recommend Yahoo or a similar non-Google number. Have you heard of a way around this (eg. a Google-provided rotating list of phone numbers just for librarians to use) - or baring that, a petition I could sign regarding this issue? We haven't encountered this in my library, but Yahoo is still the go-to for free email accounts. Has anyone else had this happened to them, and hopefully found a solution to it? Thanks. If you see the error message, "This phone number has already created the maximum number of accounts," you'll have to use a different number. In an effort to protect our users from abuse, we limit the number of accounts each phone number can create. Both of which really back certain patrons (and librarians) into a corner. What is a patron to do?